Jock Lindsey’s Hangar Bar has a little bit of everything and a little something for everyone. There are stories abound to be discovered within Jock’s workshop, and these stories can keep you entertained for quite a while. Eventually, however, you are going to want something to quench your thirst and/or something to satisfy your hunger. Luckily, the folks around the hangar have you covered with beverages to suit every taste and age and pub fare for most diets that has been elevated to an art form. Kind of like what Jock can do with a plane, right? Some of my favorite bites have circulated off of the menu, though I suspect they’ll make their way back around at some point. Meanwhile, new items have landed in the pilot’s log that I’m sure will be just as satisfying. When it comes to the beverages served up by Jock’s crew, there is no lack of delicious cocktails to partake in. Today, let’s combine a favorite beverage, or Jocktail as they’re known in these parts, and dish in a pairing that is truly an adventure. For those unaware, ginger beer is the stronger, older brother to ginger ale. It can pack a two-fisted wallop of ginger that is sure to clean out your sinuses if you’re not prepared for the kick. Hence the mule part of the name. It plays nice with the lime for that tropical drink set of flavors. The change up here comes from the inclusion of bourbon, whereas a traditional mule is served with vodka. Those of you who know me have probably already recognized my predisposition to whiskeys and bourbons, but it work particularly well here to mellow out what could otherwise be a zinging cocktail. It isn’t an adult beverage that you can drink multiples of and not feel the effects until you stand up, you will know that you are getting a strong, but well-balanced, drink right from the first sip. The small pan comes with a mix of eight savory wings and drumettes. 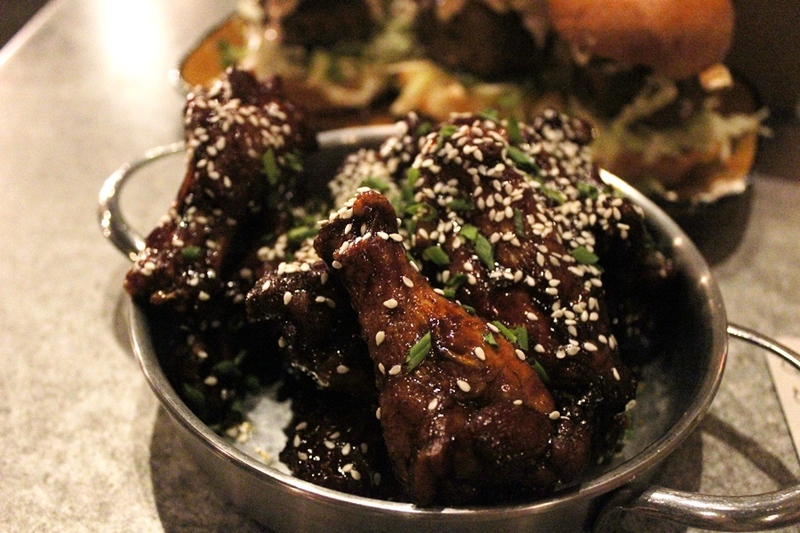 There isn’t a lot of heat with these wings, but then again we’re not in Buffalo, but they definitely live up to the sticky description. There is a great back-and-forth between the sweet elements of the sauce and the zest of the spice selection, which I would liken to a Chinese five-spice blend. The wings themselves have a crispy skin, with just a little bit of chewiness, that is the hallmark of a well prepared wing. The other telling sign of a delicious wing is the tender meat inside, which these have in spades. Our pairing works exceptionally well together, with a lot of the sharper, more impactful flavors coming from our Air Pirate’s Mule and not the wings, which would be more typical of pub drinks and eats. The ginger melts in well with the spicy elements of the Lao Che’s Revenge, while the wings’ sweetness couples nicely with the bourbon. All in all, it is a winning combination. And if you want a pro tip, save the extra sauce in the bottom of your wing pan, order up some of the Rolling Boulder Sliders, and dip the top buns into the sauce. You can thank Tony Caggiano for that one! In multiple trips to Jock Lindsey’s Hangar Bar, I’ve yet to find a truly disappointing drink or plate, and the stories present throughout the lounge are simply stellar. This may be one of my favorite pairings, but it certainly won’t be the last. 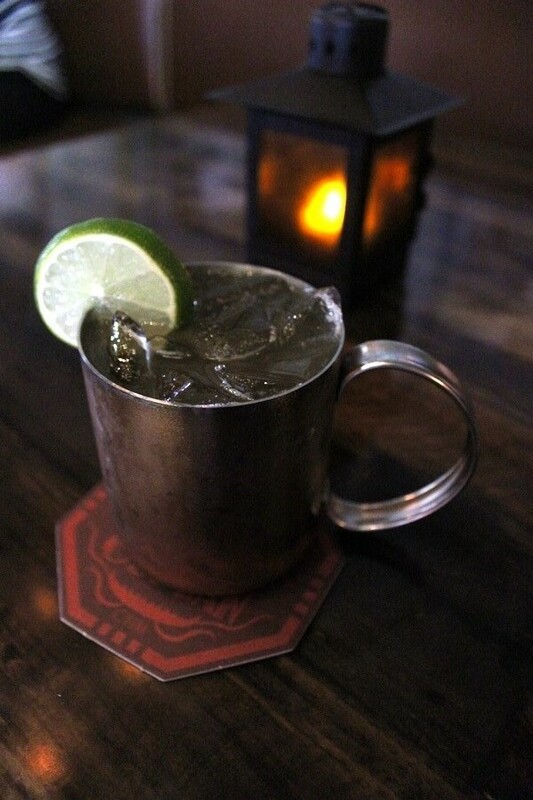 If you’re looking for something a little adventurous, but not too far off of the well-trodden path, putting an Air Pirate’s Mule together with Lao Che’s Revenge should be right up your alley. Been there, done that, and I must say it's terrific. I really enjoyed the Hangar Bar.